Then we can repair your Iphone quickly for you. 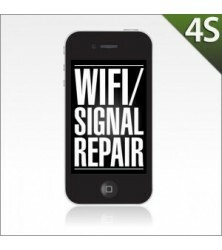 The repair involves stripping down your Iphone 4S and resoldering your Iphones main board. The Wifi chip on the main board has a broken connection to the main board. We have six computer controller resolder systems that will repair your Iphone to manufacturers specificatons. Over months and months I have been to repair shops, searched the Internet for a solution, no reasonable one found Put it in the freezer, didn't work, put it under a heat source, didn't work. Apple don't even recognize the problem caused by their own operating system upgrade on iphone 4s models. Then I found console wizard - perfect, fixed in no time!